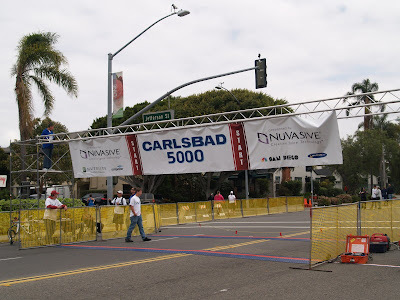 Earlier today I went to see the Carlsbad 5000. 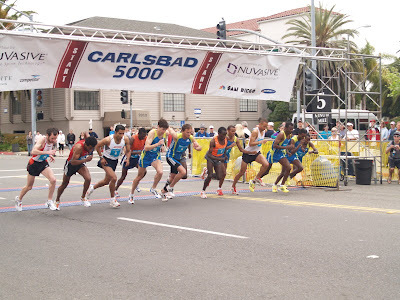 This year was the 25th anniversary of the race which bills itself as the "World's Fastest 5K" and the home of 16 world records including the current 5K road race record. The main events started early in the day at 7 a.m. with the Masters races (40 and above age group) followed by the 30-39 age group races a couple of hours later and then the 29 and below races another hour or so later. All this is the build up towards the main event - the elite invitational run. 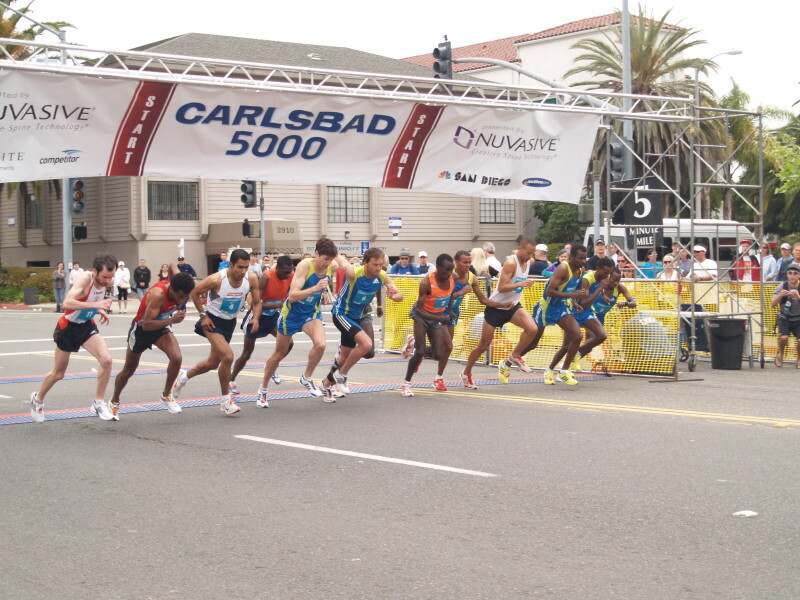 The men's race started at 12:20 p.m. It was supposed to have started at 12:15 p.m. but got delayed, apparently due to some high winds. I guess they were hoping for it to get better. Here are a few pics of them warming up. 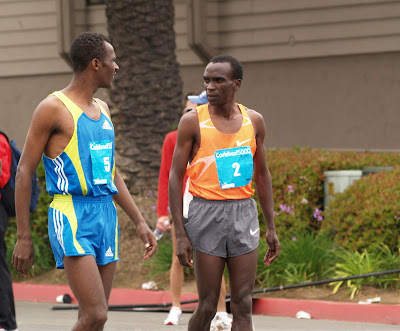 That's Marcos Geneti of Ethiopia (on the left) talking to Eliud Kipchoge on the right. Kipchoge was the pre-race favorite. That's Alistair Cragg with his boar (?) tattoo. 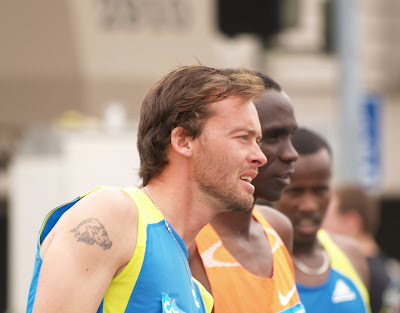 Kipchoge is next to him in the background. That's eventual women's winner Meseret Defar on her way to the warmups. I got lucky that all of them passed by on the side of the road that I'd picked for my spot. The national anthem was sung. A few seconds later, the men burst out, faster than jack rabbits. Apparently, there was a (real) pace rabbit but the winds were not too kind. The women followed less than two minutes later. The three tiny women on the right in the picture were the eventual winners. 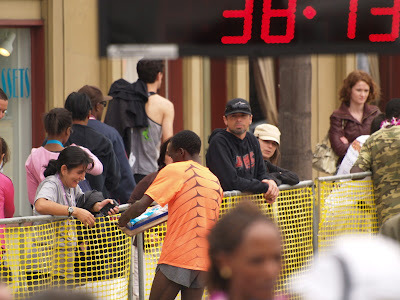 The finish line was only a couple of blocks away so that we could walk faster than the elites could run. Needless to say, they took a slightly longer route than we did. On the way we passed by the beer garden which is for all runners who participated. They get two free beers. If you thought beer doesn't smell, you haven't passed by a beer garden. This is when you truly understand the meaning of the old adage - "the sum of the parts is greater than the whole." It Stank and that's an understatement. 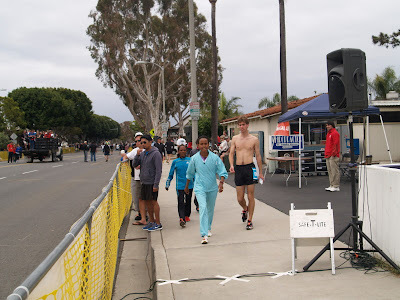 The runners, however, seemed to be having fun and it was a warm and cloudy day. Unlike the start which seemed bereft of spectators, the finish was packed tighter than the seals you can find near the Carlsbad coast. I was not able to get a good finish line picture of the winners. That's the men's winners in the pic above. Dejen Gebremeskel of Ethiopia (2nd), Eliud Kipchoge of Kenya (1st), and Bekana Daba of Ethiopia (3rd) from left to right. 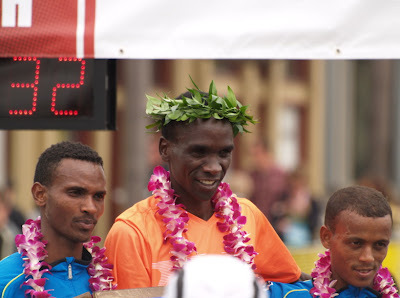 The winning times were 13:11, 13:18, and 13:24. Kipchoge seemed like a very nice guy. Here he's with someone important (I think). The announcer said something but it was hard to hear the words with all the crowds. He must have given a couple of hundred autographs easily. Below is one of him giving yet another autograph in the background while they were doing the women's presentations. Above is the secret to running a 13:11 5K - a pair of Nike Zoom Air's with Chinese symbols for speed on it. 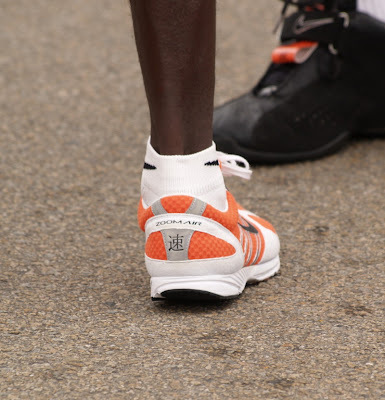 This particular one belongs to Kipchoge. 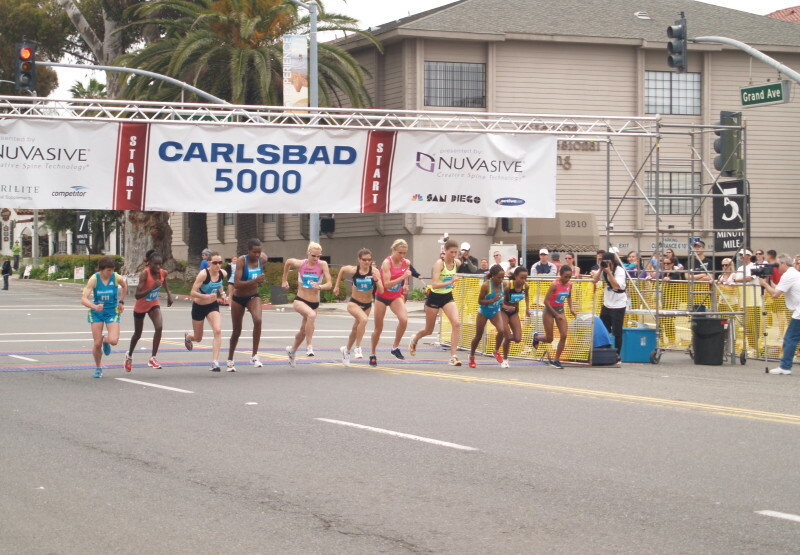 The women's race was slower than expected. 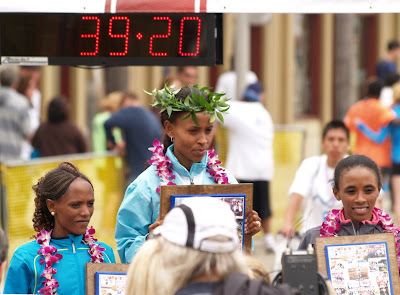 In the pic below, that's Aheza Kiros (2nd), Meseret Defar (1st), and Meskerem Assefa (3rd) - all from Ethiopia. The times were 15:04, 15:26, and 15:55. I tried to match the faces to the names using the website but it is difficult since the website has bib numbers number 101, 102, etc. 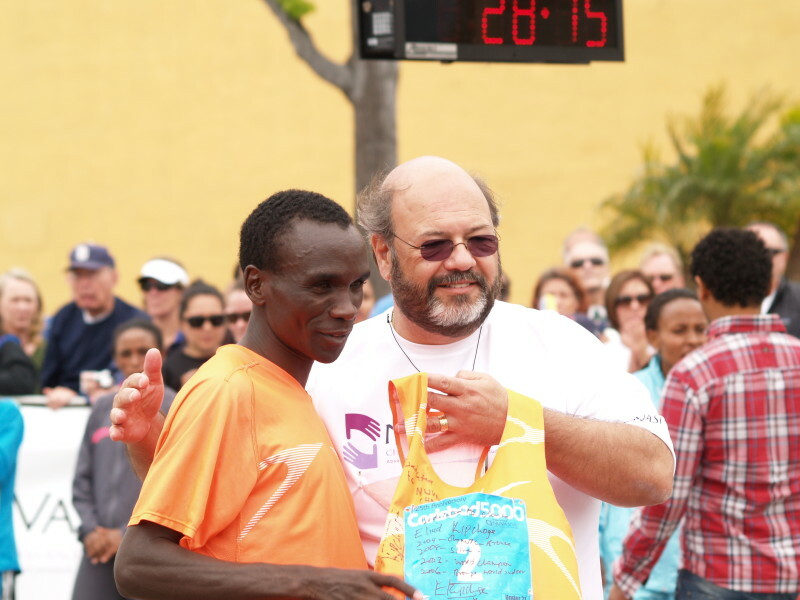 whereas the runners were actually wearing bib numbers F1, F2, etc. Defar became the first three-time champion at the Carlsbad 5000. That's Simon Ndirangu of Kenya in the Superman T-shirt. This was after he finished. 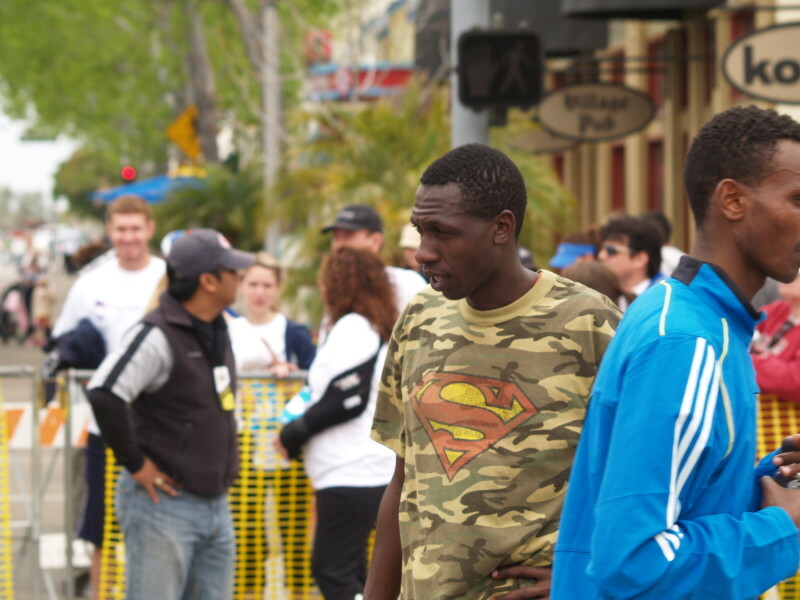 I don't think you'd want to run in a Superman T-shirt unless you are running a Halloween race. Ndirangu seemed like a very nice guy with a very big smile. I got this shot during the 7% of the time that he wasn't smiling. Carlsbad was a fun outing. The traffic coordination and other logistics seemed to be well taken care of. Parking was not much of a problem, though we didn't go for the 7 a.m. races. Weather is usually nice at this time of the year. 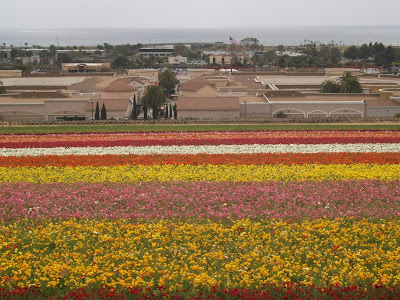 Making our way out from Carlsbad, we stopped the Carlsbad Flower Fields about 3 miles further south on the I-5. 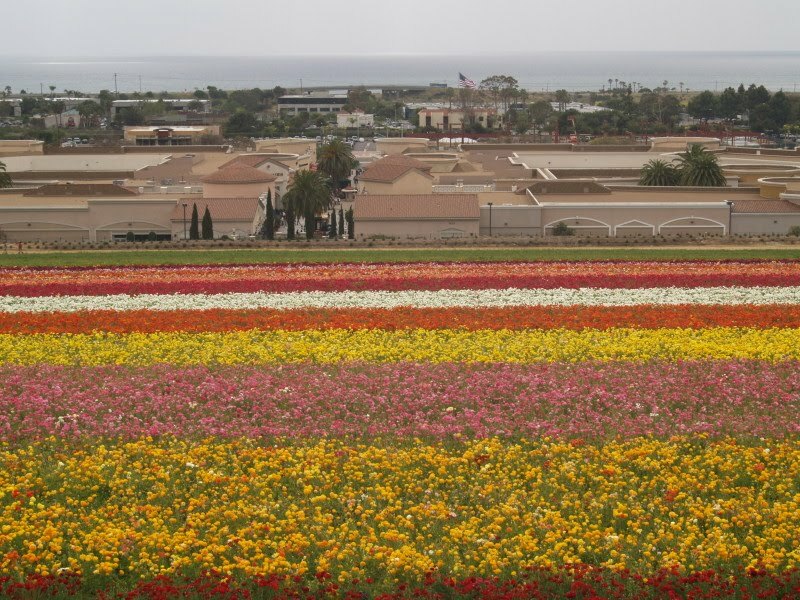 Here's one shot of the fields with the Pacific ocean in the distance. Great photos and description jobs! Thanks! Maybe next year you can enter the general event. the boar tattoo is a razorback. Thanks Anthony. If I can do so next year, I might. It looked like a fun race. Anonymous, Thanks for the info. If it can be done in shorts, I'm interested -- running, hiking/backpacking, photography. For bits-and-bytes correspondence, the id is "runjobsrun" and the email domain is "gmail.com" both without the double quotes. What is more popular - jogging or running?